Employers are they new health insurers. There has been an unheralded shift over the past years as more US employees are covered under employer self-funded insurance programs. That means that the employer does not pay a premium to an insurance carrier to assume the risks of paying for employee and dependent health care costs, but that they now pay the actual costs and assume much of the risk, and potential for savings, themselves. The companies we think of as “insurance carriers” are increasingly fulfilling an administrative role, administering claims, dealing with patient confidentiality and receiving what amounts to a transaction fee. But it won’t happen using traditional thinking and simply going with the lowest bidder for any service. This approach has put health care in the same category for businesses as rent and taxes. These 3 are the only areas where every year businesses pay more to receive the same or less. In virtually every other category they pay less for the same, get more for the same price, and in the case of technology, get more and pay less. Why then have health care costs gone the other way? We are relying on old thinking that simply has not worked. Realizing the benefits afforded by these opportunities will come by setting parameters around proven clinical pathways that save money and get better results. It will come through tracking data and validating the clinical pathways. It will come by using the resources and knowledge we have more effectively. And it will come by bringing siloed interests and parties together to achieve a common outcome. Harvard Business Review published a rather detailed article The Employer-Led Health Care Revolution, outlining how Intel has made significant inroads in reducing health care costs. 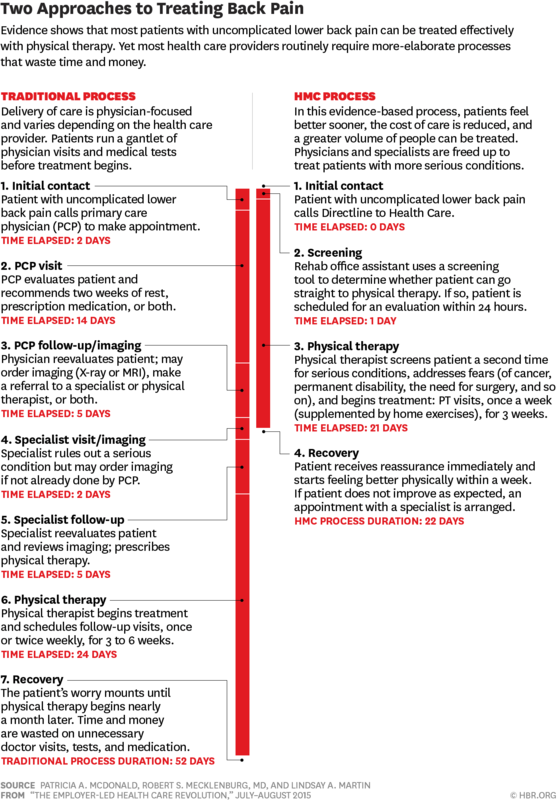 Of particular note is the Back Pain clinical pathway changes implemented, saving 30 days, more than half the time the traditional process takes to deal with back pain. What’s missing is the financial savings and the clinical outcomes, both of which promise to be superior to the traditional approach. We very much want to help change the way care is delivered for musculoskeletal (MSK) conditions. We appreciate you sharing this message. It is the future of health care, and is currently under reported and under appreciated. If you know of someone we should talk to where you work, please let us know. The best person to contact about this is Sturdy McKee, our co-founder and CEO, sturdy@sfsspt.com.